The month after President Truman recognised the state of Israel, a June 1948 Gallup poll found three times as much sympathy for the Middle East’s Jews as for the Middle East’s Arabs. This support has persisted and grown throughout the decades since, with none of Gallup’s polls since ever showing greater sympathy with Arabs or Palestinians than with Israelis. Walter Russell Mead notes the different factors explaining that support, including a common feeling of being settler nations and religious motivations. Israel’s success as the region’s only functioning democracy may similarly have played a part. But nor has this reality meant a foreign policy hostile to the Islamic world or the Arab world. 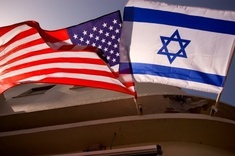 When one examines the cases where America and Israel have differed, such claims do not stand up to scrutiny. America recognised the new state of Israel within eleven minutes of its founding, and has since been consistently supportive of Israel’s right to exist. But this has not extended, then or now, to a blank cheque. In 1956 - just eight years later - Britain, France and Israel combined in a military response to Colonel Nasser, the Arab nationalist President of Egypt, who had nationalised the Suez Canal. Although the operation met with quick militarily successes, it failed because of strong American opposition. The Eisenhower Administration saw Suez as a distraction from the ongoing Hungarian revolution, and as potentially leading to a major conflict. The United States tried to pass resolutions demanding a ceasefire through the UN Security Council, though these were vetoed by the UK and France. The US then pledged to sell American reverses of sterling unless Israel, France and Britain withdrew forces, which would have precipitated a financial crisis in Britain. Faced with this pressure, all three countries withdrew. In 1973, Israel faced a surprise attack during Yom Kippur by Egypt, Syria and Iraq. After initial setbacks, Israel succeeded in fighting back against the combined Arab armies, and trapped Egypt’s Third Army. Again, America stepped in demanding a ceasefire and preventing Israel from destroying Egypt’s army. The consequences of the war led ultimately to the Camp David Accords and the US-sponsored peace treaty between Israel and Egypt. Although aid to Israel has been even higher, the peace treaty guaranteed Egypt $1.3 billion a year in military aid, with economic assistance since averaging an annual $815 million a year. In the three decades that followed, Egypt has received a total of over $50 billion in aid from the United States. This reflects a much wider point that America has close relations with many Middle Eastern countries, including Saudi Arabia, Jordan and Morocco. Although some have argued that America’s stance towards Iraq is motivated by Israeli pressure, Israel was excluded from the initial war with Saddam Hussein, after Iraq invaded Kuwait in 1990. The multinational coalition that formed to oppose Saddam included Arab countries, and Israel becoming involved on the same side risked the unity of this coalition. Even when Saddam Hussein fired missiles on Israel in the hope of provoking Israel to respond, Israel bowed to heavy American pressure and did not retaliate. Despite the support of the Palestine Liberation Organisation for Iraq during the initial conflict, Bill Clinton and George W. Bush both made considerable efforts to help the Palestinians achieve their objectives – the latter committing the US to the vision of a Palestinian state.